The experience is unique and celestial. 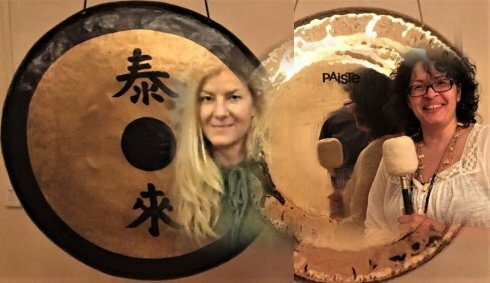 We are starting up with gentle warm ups moving forward with some therapeutic postures and deeper stretches to release tension and relax the body and finishing up with supported restorative poses to help the body to completely let go and sink into the resonance of the sound of the crystal bowls and gongs. Be prepared to move a little breathe a lot and let go all the way. * Please arrive by 6:45 pm - 7:00 pm afterwards Lobby Doors will Close. Judith Grasshopper is a co-founder of Shamanic Fire Reiki. A certified Karuna Reiki Master Teacher, offering certification in all levels of Reiki healing. 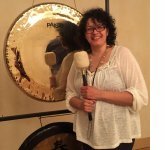 She is a certified Gong Harmonics & Sound healer, incorporating other instruments such as drums, singing bowls, flutes, and shruti box. Andrea Savolt is a long time dedicated yoga practitioner. She is teaching in yoga studios, fitness clubs and and in private settings more than 11 years. She is a certified prana yoga teacher and an inspired Anusara yoga teacher. She has studied with many remarkable teachers and keeps studying different styles and traditions of yoga. Also explored the teaching of yoga philosophy , anatomy, pranayama and meditation. She has a deep interest of energy work and healing. She has studied and practiced Reiki and Eden Energy Medicine and finished a shamanic apprentice course with Irma Star Spirit Woman. She also works with Ajna light . You can take class with her on UWS or in Astoria.